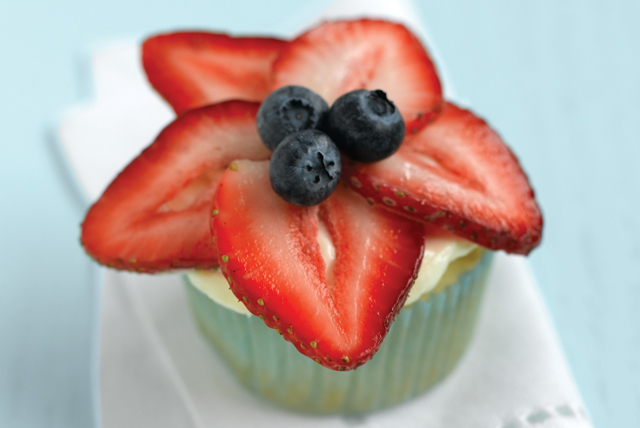 Our combination of sweet berries and luscious frosting makes these cupcakes a dreamy dessert that is also a surprisingly smart choice. Prepare cake batter and bake as directed on package for 24 cupcakes, following the reduced-fat directions. Cool in pans 10 min. ; remove from pans to wire racks. Cool completely. Meanwhile, beat pudding mix and milk in medium bowl with whisk 2 min. Stir in COOL WHIP. Refrigerate until ready to use. Frost cupcakes with pudding mixture. Arrange 5 berry slices on top of each to resemble star; fill centers with blueberries. Substitute 5 raspberries for each of the sliced whole strawberries. Use a metal 1/4 cup metal measuring cup or small ice cream scoop to easily transfer batter to paper-lined cups. Unfrosted cooled cupcakes can be stored in airtight container in freezer for up to 3 months. Frosting can be prepared, covered and stored in refrigerator up to 8 hours before spreading onto cupcakes.